Lay one oyster over another as if they’re conjoined at the hinge and you have a rough topographical model of Mount Desert Island in the New England state of Maine, a plug of pink granite heaved up from the earth and hewn down by glaciers so that a deep sound of seawater runs up its belly. It’s the second-largest isle on the eastern seaboard of the States and, to a biased former resident like myself, its most beautiful. I’m driving to its northern shore to shuck the hell out of some oysters fresh from the Atlantic. Approximately 10,000 years ago the ice retreated northwards to create Georges Bank and some of the world’s most fertile fishing grounds. Migrating Native Americans followed the caribou herds south to find a glut of marine wildlife in the Gulf of Maine. In 1619 the first English year-round fishing and trading station was established on Monhegan Island, a year before the arrival of the pilgrims on the Mayflower. 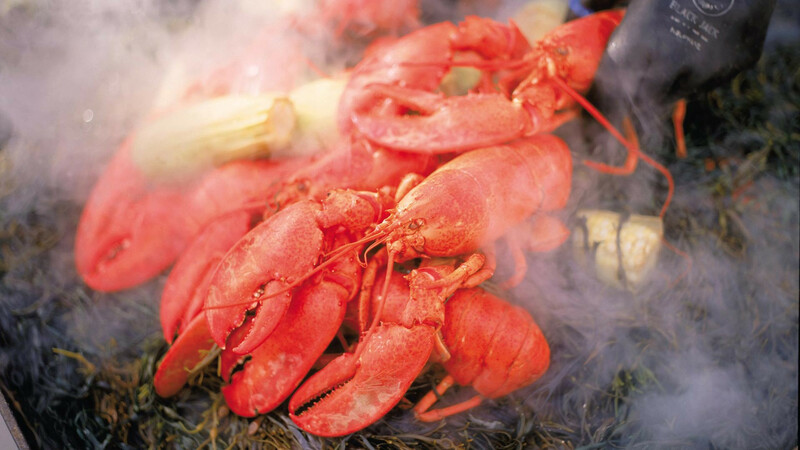 Over the ensuing centuries, seafood has become so synonymous with the state that the quickest way to identify where you’re from as a Mainer is to yell the word ‘lobster’ until you’re hoarse and your interlocutor is deaf. I wheel the car onto the gravel at Hadley’s Point. The sky is perfectly mirrored in the pellucid plane of the sea. Across its surface glides a Boston Whaler flats boat captained by Joanna Walls, a shock of yellow hair descending from the back of her sun-faded baseball cap. I clamber onto the bow and she loops the skiff around northwards to her 22-acre oyster farm, tucked between two thickly conifered islands. As we approach I get the opportunity to catch up on what’s been going on in her life. Joanna’s husband Jesse Fogg and I used to play (American) football together in high school. “Jesse’s up in the Arctic working as an engineer for half the year on a haddock trawler, and I’m either delivering sailboats or working on David Rockefeller’s yacht,” she tells me as black oyster cages hove into view – the beginnings of their start-up, Bar Harbor Oyster Company. Maine can be a difficult place for young people to earn a livelihood unless they possess a keen entrepreneurial instinct. While many islanders rely on jobs in carpentry, caretaking and fishing, Jesse and Joanna wanted to do something new. So they purchased an Oyster-Gro system and became YouTube autodidacts on all things bivalve. The results were worth the wait. We pull the cages from the dark green water and shuck a few shells. Located at the mouth of Mt Desert Narrows, a brackish creek, the Atlantic oysters have a flavour profile that’s similar to British natives, the cold water amping up the amino acids and offering a mouthful of freshness and brine. Though they’re only two years old and not fully formed in texture yet, you can taste their promise. I return to my hotel for a swift shower to wash off the salt. Maine in general and Mt Desert Island in particular are famous for having attracted The Rusticators in the 19th Century, an abundantly wealthy set of summer residents looking for an antidote to the industrial age, among them titans of finance such as JP Morgan, the Rockefellers and the Vanderbilts as well as literary lights like Nathaniel Hawthorne, Harriet Beecher Stowe and Henry Wadsworth Longfellow. Mansions sprung up across the island, including The Asticou Inn where I’m staying, constructed in 1883 by an extremely distant relative of mine – AC Savage. 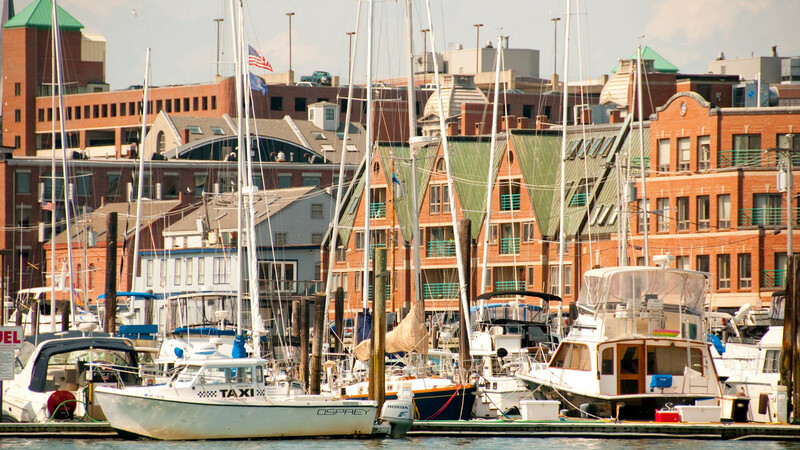 It’s a remarkable building because it’s one of the few to survive the Great Fire of 1947, which destroyed the majority of Bar Harbor’s old piles. The hotel offers keyhole insights into the past, as well as beautiful views, comfortable beds and the best happy hour in town. 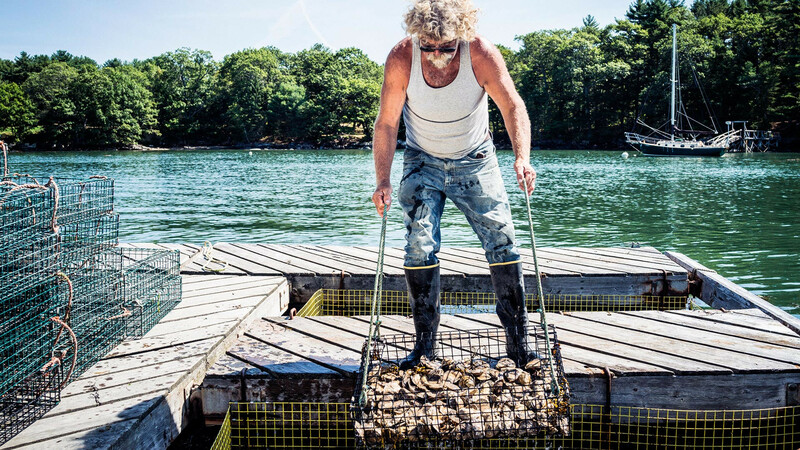 An oysterman hauls his catch up from the water. 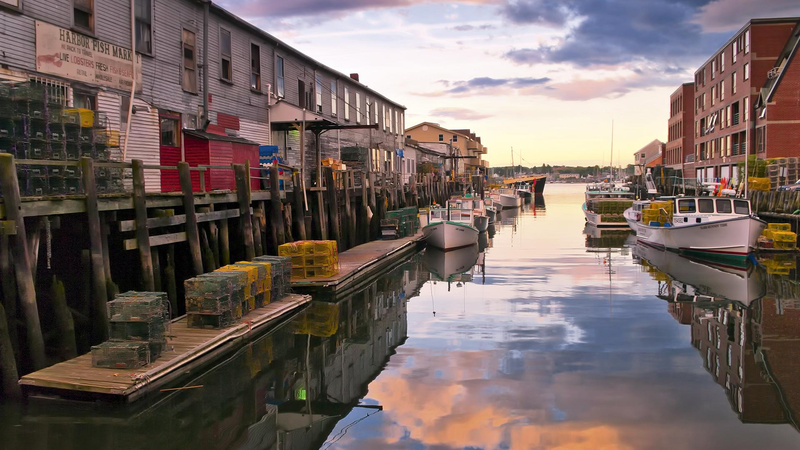 The state of Maine has been associated with fishing and seafood for hundreds of years. From here I drive through Seal Harbor, summer community to many of America’s oldest families, and north on Route 1 across Hunter’s Creek and beneath the rose-coloured southern slope of Cadillac Mountain, eventually reaching the sleepy, leafy municipality of Otter Creek and its excellent seasonal restaurant Burning Tree. Originally opened in 1987 by Allison Martin and Elmer Beal Jr, it helped plough the furrow for farm-to-table restaurants in New England. In between a plate of crispy kale with oven-roasted littleneck clams and a bouillabaisse teeming with monkfish, cod, scallops and mussels, I manage to collar Allison for a chat. “Originally the restaurant started as a senior project when I was at College of the Atlantic, to examine the state of American agriculture,” she says. Over the past century, the cod, haddock, pollock and flounder fisheries have been decimated, with only lobster remaining abundant, due in part to the ineffectual nature of lobster traps, which actually feed the crustaceans more often than they catch them. That may be true, but anyone who dines at Burning Tree will attest that her cooking is the calling card of a consummate chef. Driving back through the state’s largest city – Portland – I stop off in the Old Port to meet with Matthew Moretti, who with his father runs Bangs Island Mussels. Just a minute’s walk down the jetty from clamorous Commercial Street I find him putting a fresh coat of paint on a cuddy cabin. Nearby is the tugboat that he lives on with his girlfriend, who is sunning herself and reading a book. As I prepare myself for the flight back to London and inevitably my shoebox flat, I feel envious of what at the moment resembles a pirate’s life. Instead of Spanish doubloons Matt’s fortune revolves around Spanish raft- style rope systems, which currently have 300,000 pounds of mussels growing in Casco Bay. Bought by all of the best restaurants in the city and sold across the country, they carry a certain aspirational gravitas. With a hard-earned education from Bates and Northeastern College, Matt isn’t quite ready to abide by the status quo, and has expanded his operations to farm wakame, sugar kelp and scallops, with a trip planned to visit the pioneers of this technology in Japan. Double rooms at The Asticou Inn are available from $230 a night during high season (about £180). There’s a tendency among Mainers to go out into the world during their twenties and then return to the state to raise a family. After a week spent around enterprising young people working hard to innovate Maine’s working waterfront, I’m grappling with the inclination to do the same. Has this travel piece got your mind wandering and your stomach rumbling? Oh good. Then we suggest you keep it up and read more here.